After being inexplicably passed over for the centerfield job in favor of Carlos Gomez out of spring training in 2008, Denard Span joined the Twins at mid season and hasn’t stopped hitting, drawing walks and stealing bases ever since. Now with Gomez jettisoned to Milwaukee, Span can finally call centerfield his permanent home. I caught up with the always chatty, often funny and usually entertaining 26-year-old star before tonight’s game against the White Sox. DZ: We’re a little over a month in to the season now - a lot of changes (from last year), what are your impressions so far? SPAN: The biggest change is moving into the new stadium. So far, I think it’s been a good transition. Coming here, playing here, it almost feels like now that we’ve been here for awhile. It’s always easy to come to the field when you come here and there’s 35 to 40,000 people in the stands to play in front of. DZ: Have you ever caught yourself coming in here and just kind of going on autopilot to the Dome? SPAN: One day I did (laughs). One day I took a different route - I came from the barbershop - and almost made the turn towards the Metrodome. I kind of caught myself. I think that was the last home stand or something like that. I definitely don’t miss that place; there’s a lot of memories there, but I think everybody has already fallen in love with this place. DZ: This year - for you - one of the big differences is that you knew coming you were going to be the centerfielder - there was no question about that. What did that mean to you? SPAN: I meant a lot to me, man. 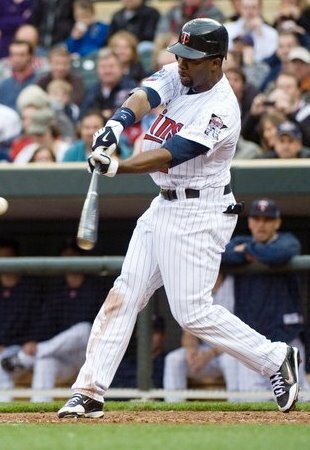 (When) the team drafted me in 2002, a goal of mine - a dream of mine - was always to take that position on opening day one day and when people think of the Minnesota Twins they think of Denard Span as their centerfielder. It meant a lot for me to take my position on opening day and to now have that position. DZ: It’s got to be pretty cool playing that position knowing in the last 25, 30 years that Kirby, then a few other guys in the mix, then Torii Hunter and now you. That’s got to be pretty cool. SPAN: Yeah - that’s another thing - the centerfield position is such a special position here in this city. Like you said, we’ve had two greats already play that position before me. There’s no way I can follow up what they did; I just want to go out there everyday and play hard and try to start my own fan base and my own legacy. DZ: Did you ever meet Kirby in spring training before he passed away? SPAN: I can’t remember meeting him. The only time I think I would have maybe met him was when I got drafted and I came to the Metrodome. If I did, I don’t really remember it. I think I would have remembered it if I had met Kirby Puckett. DZ: Being a leadoff hitter, a lot of emphasis is put on on-base-percentage. Is that a stat you keep track of? SPAN: Yeah, on-base-percentage and runs scored for me are real important stats. I look at my (batting) average - that’s big too. I know if I am getting on base and scoring runs and the team is winning; I know that I am doing what I am supposed to do. DZ: In the beginning of the year your average wasn’t so good, but your on-base-percentage was up; did that help your confidence? SPAN: Definitely, definitely. Anytime I can draw a walk and get on base - especially when you’re struggling - for me, those times when I am struggling or whatever - a walk just gives me a little bit more confidence. It definitely helps me just to get on base and maybe come around and touch home plate and come in and slap five with everybody. That does give me more confidence the next time I do come to the plate. DZ: Does trying to draw walks stop you when are slumping from maybe swinging at bad pitches, trying too hard? SPAN: Yeah, definitely. That’s happened to me this year too. Certain counts - good counts - 2-0, 3-1 maybe getting too aggressive and swinging - I’ve done that couple of times - swinging at ball four. It, being early in the season, it seems like I’ve already made three or four adjustments. Trying to be more aggressive and then changing from that to being more selective and patient. I think I am better off when I am patient and picking my times to be aggressive. SPAN: I hope so. I stole 23 last year, I definitely want to steal more than that. It’s going to take a process, you just want to continue to get better each year, each day, each week. Base stealing is a lot more than just running and pure speed. I am learning, I am getting better. It’s still a goal of mine, usually when I have a goal, usually - if I don’t get to it - I come close. DZ: Is there anyone you talk to about base stealing - the coaches, do you work with Paul Molitor at all? SPAN: At spring training, I talk to him a little bit. Of the coaching staff, I probably talk to Jerry White, our 1st base coach, before the game or sometimes when I am on 1st base we talk about certain situations - what to look for. DZ: One last thing, while I was looking on ESPN.com today, I was surprised - Denard is actually your middle name. What is the story behind that? SPAN: Yeah, it’s my middle name. Growing up in elementary school - you know on the first day of school the teaches go down the roster - the roll call or whatever - every time she’d come to my name, she’d fumble with my first name. It’s Keiunta (key-on-tay) and the way it’s spelled, it’s tough to pronounce. I think (when) I got to the second or third grade, I got tired of teachers butchering my name. I knew that they would get to the guy right before me - Smith or something like that - I knew I’d be coming up next and I could tell - they’d look at the roll call and their face would get puzzled…as soon as they would even try to say Keiunta - I would say “Just call me Denard”. It just kind of stuck from there. DZ: Does your mom call you Denard? SPAN: Yeah, everybody does. Nobody calls me by my first name - a couple of friends would do it as a joke. A couple of female friends in high school. This entry was posted on Tuesday, May 11th, 2010 at 8:21 pm	and is filed under MLB, Twins. You can follow any responses to this entry through the RSS 2.0 feed. You can leave a response, or trackback from your own site.